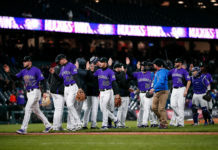 Rockies right fielders Carlos Gonzalez reached a benchmark in franchise history on Saturday, becoming only the fifth player to hit 200 career home runs for Colorado. His next home run will tie him with Dante Bichette for fourth on the team’s all-time home runs list. Gonzalez joins an elite group of Colorado sluggers to have reached the 200 home run plateau with plenty of time left in his career to keep ascending that list and others (assuming, of course, he stays in Colorado beyond the expiration of his contract this year). Gonzalez needs just two home runs to pass Bichette for fourth on the all-time list. 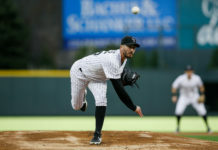 He has some distance to make up on both Castilla and Walker, but two more productive years in Denver could be enough to move him all the way into second place behind Helton. Gonzalez can pass Castilla this season to move into third place on the games list, assuming he stays healthy through 2017. He’s played 150 or more games in each of the past two seasons after playing just 70 in 2014. With that in mind, Bud Black has a plethora of talented outfielders at his disposal (especially when David Dahl returns from injury), so CarGo could get a few more veteran rest days than in years past. Gonzalez slights slightly up this list and trails Bichette by just over a tenth of a percent, hitting a home run in 19.63 percent of the games he’s played for Colorado. He’s yet to heat up in 2017, as he so often does, so this efficiency rating could easily leapfrog Bichette this season. With only three home runs so far in 2017, a hot streak as Gonzalez is prone to have in June and July should get it done. Gonzalez has a superb eye at the plate and is an outstanding situational hitter, so his raw at-bats numbers are behind Bichette’s, even though he’s played one more game. Based on his career averages, CarGo could move all the way into second place on this list this season if he stays healthy. CarGo slides into a fairly comfortable third place on this efficiency ranking, but he’ll need to start clubbing more home runs this season if he wants to maintain his place. As Todd Helton knows, power efficiency numbers can decline rapidly later in a player’s career. Barring a nightmare year, there’s a very good chance Gonzalez will move past Castilla on this list in 2017. A career year would have him nipping at Bichette’s heels. He racked up 150 and 174 hits over the past two years, respectively, so it’s not outside the question. He’s off to a slow start this year with only 33 hits, but as the players around him continue to be productive he should get more opportunities to produce. No one hit a larger percentage of his base its out of the ballpark than Castilla, but Gonzalez is no slouch with nearly 18 percent of his hits leaving the yard. 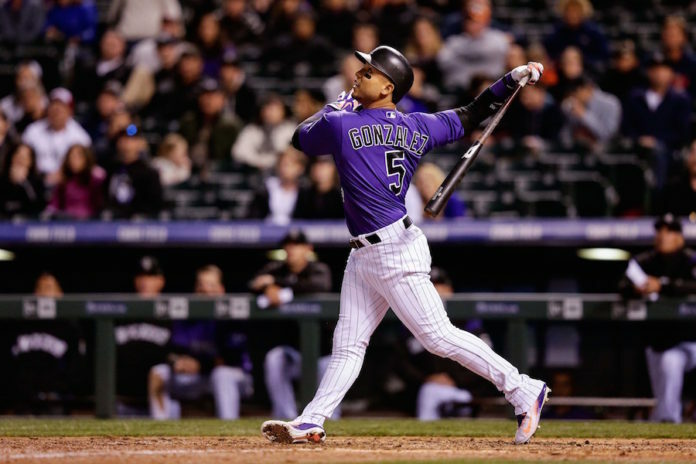 CarGo has long been known as a guy who can change the complexion of a game with one swing, and this is precisely why. Lost in the “home run count” when Gonzalez reached No. 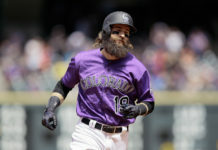 200 was that he also passed Troy Tulowitzki for fifth all-time in total bases for Colorado. At his current pace this year, he won’t pass Castilla or Bichette. But if he heats up as he always does during the summer months he could easily overtake both. In one of the truest power efficiency measurements (outside of OPS), the speedy and powerful Walker outpaces all four of his peers in total bases per at-bat. Gonzalez comes in a surprising tie for fourth on this list with Castilla. He’s hitting only .221 through 40 games this season, though, so an upswing in numbers as the season hits full stride ought to give him a little boost. CarGo’s slugging percentage this year is the lowest its ever been, and his on-base percentage isn’t particularly good through the early part of the season either. Home runs are nice, round numbers but they don’t contribute to the greater good nearly as much as OPS. Cargo will likely rank in the top three in most of the major statistical power categories by the time he’s done in Colorado, but he’s definitely got some ground to make up on OPS. While he ranks fourth among the 200 home run club, he’s eighth on the full all-time list.